Frederik August 27, 2014 Comment? Three new video clips have been added to the archive. First, a making of for “The Drop”, including interviews with Noomi Rapace and Matthias Schoenarts. Then, a speedy television spot for the film. The third addition is a public service announcement that Noomi has done for ECPAT Sverige. While I wish my Swedish was better, I think it’s raising awareness for the prevention of child abuse. Noomi has followed in her “Child 44” co-star Joel Kinnerman’s footsteps, who’s made a very successful PSA for ECPAT Sverige in the first place. Click the previews below to watch all new videos. Here’s a first clip from “The Drop”, due out next month, in which Tom Hardy and Noomi Rapace choose a name for their found dog. Watch the scene in the video archive. The Drop marks the return of Michaël R. Roskam to the director’s chair for the first time since he made his debut with Bullhead. The Drop follows lonely bartender Bob Saginowski (Tom Hardy) through a covert scheme of funneling cash to local gangsters – ‘money drops’ – in the underworld of Brooklyn bars. Under the heavy hand of his employer and cousin Marv (James Gandolfini), Bob finds himself at the centre of a robbery gone awry and entwined in an investigation that digs deep into the neighbourhood’s past where friends, families, and foes all work together to make a living – no matter the cost. Frederik June 20, 2014 Comment? Empire Magazine has a Friday treat for everyone who’s looking forward to “The Drop” – the film’s UK poster and trailer, which features new scenes with Noomi. Here’s what they write: Tom Hardy stars as Bob Saginowski, a quiet man living in a poor part of New York City. He tends bar for his Cousin Marv (James Gandolfini), a bar that also operates as a drop point for illegal merchandise and money. He meets Nadia (Noomi Rapace) when he rescues a beaten dog outside her house, but has bigger problems on his mind after the bar is robbed at gunpoint and Bob finds himself pulled into the investigation of what happened. Roskam’s Bullhead star Matthias Schoenaerts plays the injured dog’s owner, Eric, who butts up against Bob when he tries to reclaim the injured animal and John Ortiz rounds out the cast as a police officer investigating the robbery. Frederik April 03, 2014 Comment? 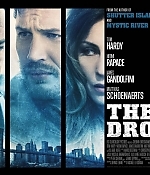 Fox Searchlight has released the theatrical trailer for “The Drop”, starring Tom Hardy, Noomi Rapace and James Gandolfini in his final film. Directed by “Bullhead” filmmaker Michael Roskam, “The Drop” follows an ex-con trying to go straight, working a legit job in a bar, whose life gets upended by a robbery gone wrong. It’s potent stuff, particularly for this Brooklyn-set tale, and Roskam knew he had a great duo in Hardy and Gandolfini, according to a recent article by USA Today. “I could see there was a bit of a smile between them. It was like, ‘We’re going to nail this, right?’ ” Roskam said of the production. “And they did this intense scene and were just spot on. There was a beautiful connection between those two guys.” You can watch the trailer in the video archive, screencaptures have been added to the photo gallery. Frederik August 23, 2013 Comment? It’s been a while since the video archive has received some proper care, so today’s update will surely make up it with that. Eighteen new clips have been added, ranging from Noomi’s 2009/2010 promotion for the “Millennium” trilogy around the world, various public appearances to a couple of “Prometheus” screen tests and a recent appearance at the Apple SoHo Store’s “Meet the Filmmakers” series for “Dead Man Down”. For a complete list of all new videos, simply click one of the previews below. Enjoy watching! Frederik July 03, 2013 Comment? Many of today’s great actors have made their first steps on soap operas – and Noomi makes no exception. Back in 1996, when she still went by her birth name Noomi Norén, the 17-year-old had her first professional job on the Swedish soap “Tre Kronor”, playing troublemaking runaway Lucinda Gonzales. She appeared throughout the show’s sixth season before her character was reunited with her parents. I’ve added clips from all of Noomi’s twelve episodes to the video archive. Enjoy watching. Frederik July 01, 2013 Comment? Today, the US trailer for “Passion” has been released – exactly the one shown by Entertainment Tonight two days ago. Additionally, I’ve added three clips from the film to the video archive. Two scenes feature Isabelle (Noomi) and her boss Christine (Rachel McAdams). The third clip sheds some light on Isabelle’s relationship with her assistant Dani (Karoline Herfurth). The clips are all rather brief, but worth to get you in the mood for the film’s August 30 release in the USA (it will release theatrically and on VOD). In case you can play R2 DVDs, you can also get French release of the DVD and Blu-Ray over at Amazon.